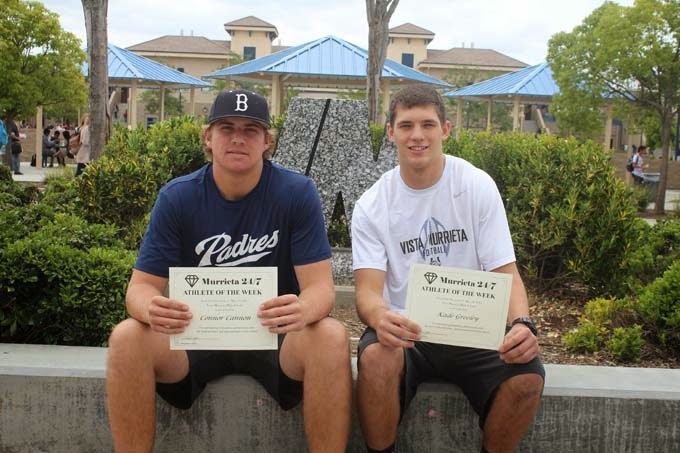 Connor Cannon (left) and Kade Greeley are the Vista Murrieta High School Athletes of the Week. Junior pitcher Connor Cannon has played a big role for the Broncos baseball team, which is 18-8 overall heading into Thursday's CIF Division 1 home playoff game against Harvard-Westlake. He is 4-2 with a 1.62 ERA and three saves this season. He also has four home runs and 21 RBIs as a batter. Boys volleyball standout Kade Greeley had an outstanding year for the Broncos, who finished a 14-9 season with a playoff loss to San Gabriel. In that match, he had a career-high 11 blocks in one game and four blocks. These athletes will be eligible for selection as Vista Murrieta High School's Athletes of the Month, which will be announced the first week of June. Anyone wishing to order a glossy print of this article with photo may do so by emailing murrieta247info@gmail.com.